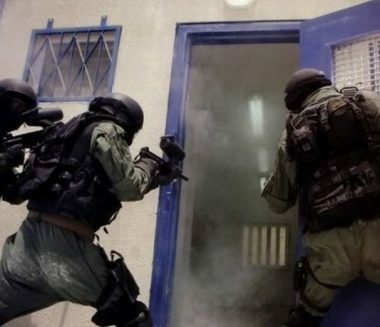 The head of the Palestinian Detainees’ Committee, Issa Qaraqe, has reported that two Israeli soldiers have been stabbed in separate incidents, as the army, and special forces, continued the invasions into the detainees’ rooms, and the assaults against them. Qaraqe’ said that one of the detainees slashed a soldier with a blade, in section 16 in the Negev detention camp, and that the army fired many gas bombs. He also stated that the soldiers then cut the power supply, and started extensive searches for the detainee who stabbed the officer. The army conducted extensive searches in Sections 13, 14, 15 and 16, and assaulted many detainees in the process. Earlier Thursday, a detainee attacked a soldier with a sharp object, and wounded him, before other soldiers intervened, assaulted the detainee and placed him in solitary confinement. The detainees in the Negev have lately been subject to extensive assaults by the soldiers, especially the Matzada special forces, causing mounting tension. At least 400 Matzada officers invaded the detention camp, just hours before the stabbing, and violently searched the detainees and their belongings, in addition to spraying them with pepper spray. In related news, dozens of soldiers and offices of the Israeli Prison Authority invaded, on Wednesday evening, sections 2 and 12 of Nafha prison, also in the Negev desert, and forced the detainees into the yards after cuffing them, and searched their beds. The soldiers also assaulted many detainees and sprayed them with pepper-spray, while dragging them into the yard.